Author of She Rose and Lyrics for Langston. Accomplished stage and screen actress. Award-winning performance poet. Engaging keynote speaker. Venus is a star that’s down to Earth and she wants to help you shine and rise to your fullest potential with love, laughter and light. If you’re booking talent for your special project, look no further. Contact us for workshop and booking info. Once there was a little shy girl who was named after a Goddess. She wanted desperately to represent love and beauty for her namesake. So God placed her among roses and thorns. She blossomed! Welcome to a place where we can still watch Venus Rising and find inspiration as she helps you rise to your fullest potential because she sees the God in you! Venus is on a mission to transform more girls into Goddesses with her She Rose workshops and she’s looking to promote unsung S/heroes among us. Shero is a term she coined in 2006 with the release of her debut book “She Rose” and it’s since spread far and wide. Venus is a former MTV Online correspondent, radio personality, actress, and writer, who’s opened for Def Poetry on Broadway and partnered with Ms. Magazine, Spoken Vizions, African Voices, and after school programs like Boys and Girls Clubs of America, and Girls Inc. She’s also the author of Lyrics for Langston and four empowering spoken word CDs. This accomplished actress and poet is determined to let her little light shine, like a star that’s down to Earth. Venus is Langston Hughes in the form of a black girl! This girl is going to make it! Venus is on a ship, rocketing to Mars. It’s a joy to experience her work! Insightful! Venus transports those who experience her creative voice! Awarded “Most Inspiring Solo Performance” at the Los Angeles Women’s Theatre Festival for her one woman show entitled Poetic Soldier. “Everything is, and will always be, completely copasetic.” Venus recites her poem “Copasetic” at Patel Conservatory. 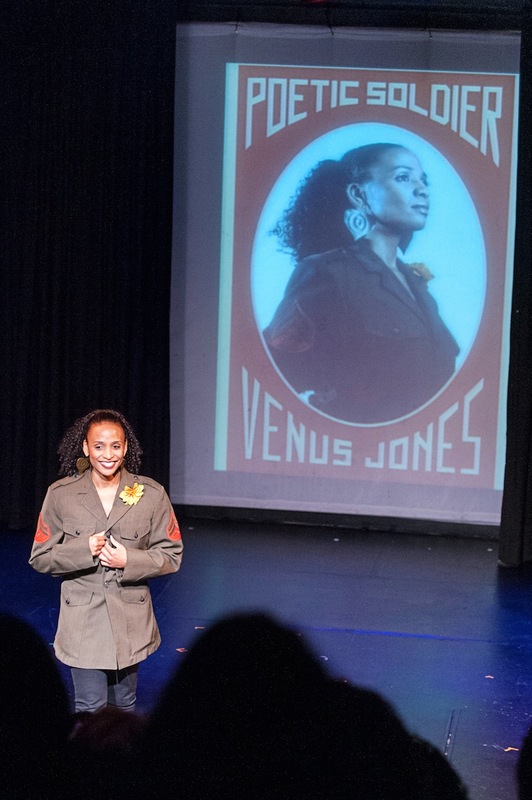 Venus performing for women’s history month at Booker High School in Sarasota, Florida. Subscribe to my Venusian Updates and you’ll be supporting a light worker and receive word on local and national appearances, a poem, and updates on how to attract love and keep your peace during times of war. Let’s practice victory over violence! Copyright © 2018 Venus Jones. All Rights Reserved.